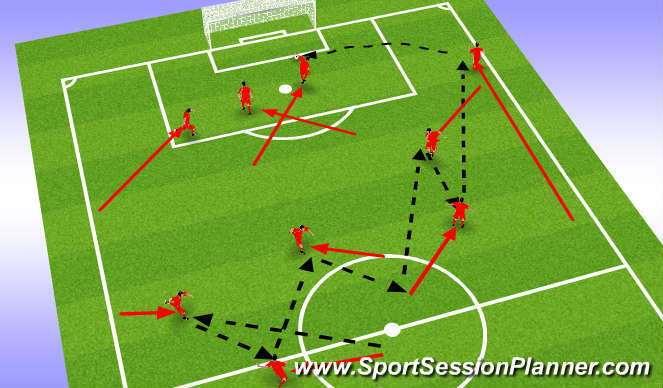 Session starts with centre D playing ball out to full back and making a movement to receive ball ball so he can play ball forward to midfielder( body potion on recievin ball needs to be open and facing attacking goal). Communication to start exercises should happen (verbal and visual) this will give the full back time to react and make his run at the right moment. Now this is where we have all players on the pitch watching players movement so they can react and become part of the attack. Up on midfield player 2 receiving the ball ( now facing the opposition goal) our winger moves inside to become an option and want the pass. on the wingers movement the full back on his side will look to make a forward run in to the space left. as this run is happening the winger lays the ball back in to the midfield 2 players path, this will lead to a 1st time ball in to space for the full back to move on to and look to cross. the job of the opposite winger is to move in from touch line to get inside area and look to got on the end of the cross if it gets over hit. This exercise has a lot of movement, its important to work on each unit at a time, and encourage quick passing and timing of movement. we work both sides and get use to the set up, looking for communication all over the pitch, when wanting the ball or creating space to move in to.